← We Hope You’ll Join Us New Year’s Eve On WGN! As we write this, it’s January 8 (Happy Birthday Elvis, Wayne Jancik & to Johnnie’s Aunt Wilma!) 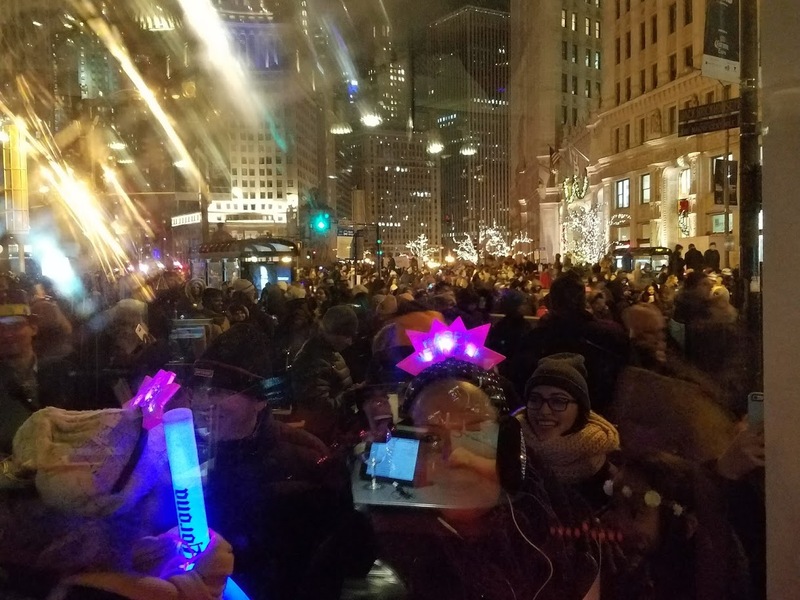 and we think we’re starting to recover from our “Cheap Date Life After Dark New Year’s Eve Extravaganza” on WGN Radio!! Just a small portion of the Michigan Ave. crowd right outside the WGN studio. For those of you who have asked, here is a link to the podcast. And, courtesy of our friends Daiki Ishiyama and Masako Yoshizawa, here is a link to an album of photos and videos from the night’s festivities. Our thanks to Ronnie Rice, Lisa McClowry, Sidney Friedman, Josh Solomon and Erika Brett from The Empty Pockets and all of our other friends you will hear in the podcast and see in the photos and videos who were nice enough to think that spending New Year’s Eve with us would be a good time. And, most importantly, thank YOU for continuing to hang out with us on the air and online. As we’ve said before, we never take your friendship lightly. This entry was posted in Holidays, Uncategorized, WGN and tagged Doyle Dykes, Johnnie Putman, Life After Dark, Lisa McClowry, Ronnie Rice, Sidney Friedman, Steve & Johnnie, Steve and Johnnie, Steve King, The Empty Pockets, WGN AM, WGN Radio. Bookmark the permalink. 5 Responses to Well, THAT Was Fun! YOU are first class ! I couldn’t listen.. but NOW!! I can. I’m telling you, people…..Him and Her can’t be beat…THEY BROKE THE MOLD WHEN THEY GOT TOGETHER. THANK YOU…..YOU’RE THE BEST.